Morocco is synonymous with medinas, souks, mosques and labyrinthine streets. It is a land of magical deserts, fertile oases and lush valleys. But it also has paradisiacal beaches, wide palm groves, coniferous forests of great beauty, natural parks and large mountain ranges with impressive peaks, in which the snow remains for most of the year. Without a doubt, a whole festival for the five senses. And continuing with the spell, as if it were a mirage, Morocco offers travelers majestic sand-colored fortresses of unparalleled charm. Citadels that dot the so-called Route of the Thousand Kasbahs, the route of the old Berber fortresses at the junction of the roads leading to the Draa Valley, the Valley of Roses and the Valley of Ziz. It is an unforgettable tour, through one of the most fabulous tourist trails in the entire African continent. In our customized routes to Morocco we can go down to the South and make a stop to visit the Ksar Aït Ben Haddou, a fortified city declared a World Heritage Site by UNESCO in 1987 and famous for having been the setting for several films like Laurence of Arabia, Gladiator, Cleopatra and La Joya del Nilo, among many others. Aït Ben Haddou is located in the province of Ouarzazate, in the region of Souss-Massa-Draâ, and extends along the Ounila River. Most of its inhabitants live in the new village on the other side of the river, however, some families still live in the old Ksar. And continuing further south, we find the mythical blue men who will captivate us with their greatness: the Berbers of the desert. The women, with their hair dyed with henna and wearing enigmatic tattoos that adorn the face, feet and hands, will leave us fascinated. A culture that bewitches and at the same time falls in love with the hospitality and affection that they waste. But the charm does not end here. On the Moroccan coast, the always fascinating Casablanca, with the extraordinary Mosque of Hassan II and the old Portuguese possession of Agadir, remain silent witnesses of the past waiting to be visited. Without forgetting the beauty of Essaouira, with its beautiful medina facing the sea and its extensive beach, much appreciated by lovers of water sports. This city, with its bohemian atmosphere, keeps its medieval structure in very good condition. Its medina, together with the kasbah and the mellah (Jewish quarter), were declared a World Heritage Site by Unesco in 2001. Strolling through the narrow streets of the walled area full of craft shops, exotic cafes and mysterious corners is a sensory experience that you can not miss. And finally, Tangier, the door of Morocco from the Mediterranean that, together with the majestic Tetouan, also deserve to be visited for its beauty. The latter has an important historical-cultural attraction. In short, Morocco has it all. You look for what you are looking for, very likely in Morocco I am waiting for you. But if we had to highlight something of Morocco, it would undoubtedly be its infinite desert. Its bewitching golden dunes, those beautiful sunsets that come to overwhelm you and the feeling of inner peace that invades you when you contemplate them, is something difficult to explain. And as much as we try to do it, nothing would surpass the experience of living it yourself. If there is something you can not miss during your visit to the desert, it is spending a night in the middle of the dunes, under a sky dotted with thousands of stars. Undoubtedly, the desert of Morocco is a magical place where there are, a paradise full of colors and a thousand sensations. Venture to discover the Moroccan desert with Merzougadunestrip.com. 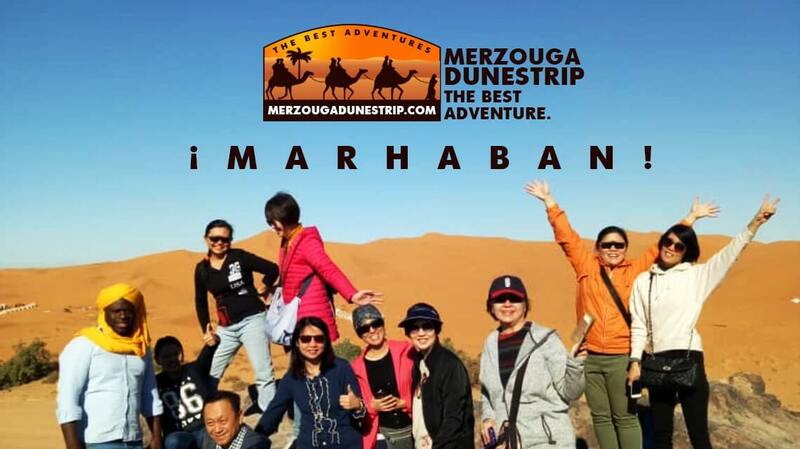 Passionate about our work, at Merzougadunestrip.com we create our trips with enthusiasm and a great effort to show you this beautiful country in all its facets. We are willing to accompany you in this experience and make your trip to Morocco unforgettable and very rewarding.